I’ve had three boxes of fabric piled up in my dining room for weeks now. It’s been sitting there urging me to do something with it, reminding me daily of the commitment I made to do my best to transform it into something wonderful. I accepted the fabric on behalf of the Craft Club I organize at the YMCA in Grand Rapids. The donor was Mary Dunneback, an 82-year-old woman looking to retire from quilting and get her fabric into good, crafty hands. 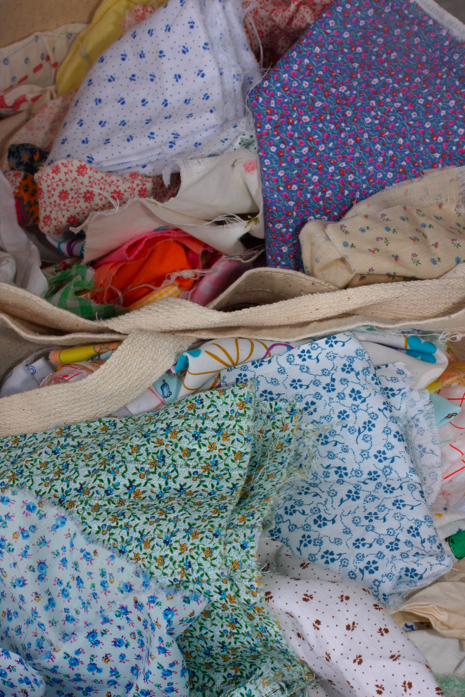 When I got the fabric home and began unpacking the boxes, I realized the weight of Mary’s decision to de-stash on her own terms now that she’s no longer able to quilt like she used to. I immediately started working on a plan to orchestrate a large public quilting event. I wrote a column about Mary and invited fabric lovers from all walks of life to join me next Tuesday night to make quilts out of Mary’s fabric. I’m not sure how this quilt adventure will end, but I’m really excited to find out what will happen next Tuesday night when we meet for the first Community Quilt Bee event I’ve ever been a part of. Mary is the inspiration for this event. Her donation presented a great opportunity to spread the craft to the whole community, so I didn’t want to mess this up. Every quilt has a story, and I can’t wait to meet all the people who will stitch a piece of themselves into the ones we’re about to make. Grab your rotary cutters, folks. It’s time to rock this fabric stash! Even if we overload the power grid at the Y with our irons and sewing machines, I believe this is going to be a wonderful experience. Mary helped build the local craft community by giving away her fabric. Now it’s up to us to stitch it up and get our quilts into deserving hands. Stay tuned for updates on how things progress, as I plan to document this experience. If you’ve ever organized a community quilt bee, feel free to share any words of wisdom that you think might be helpful. Have a lovely evening. I’m off to make a sample quilt block with the girls.